We support local food initiatives including the Woodstock Winter Farmers’ Market. We produced the Woodstock Area Farm and Field Guide, and promote local food at the annual Trek to Taste and Naked Table events. In summer 2011, we funded a pilot project to explore a Local Healthy Food Network. This initiative was just getting started when Irene hit. Still, the pilot highlighted the challenges of getting a local food system to work in our rural communities and laid the groundwork for future efforts. Started in 2009 under the guidance of master gardener Anne Dean, Sustainable Woodstock’s community gardens are now located at two sites: Billings Farm, Woodstock and King Farm, West Woodstock. These gardens are used by more than 25 families and organizations. 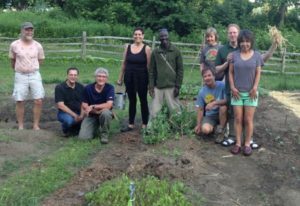 The Sustainable Woodstock Community Garden Council manages the gardens, in keeping with its mission to “foster a community of friendship and cooperation through organic gardening.” Its activities include garden talks; community dinners; work days; and communal purchasing of plants and seeds. Some of the gardens such as the one tended by the Change the World Kids grow food entirely for the Woodstock Community Food Shelf, and other individuals and organizations also donate their surplus food. In 2010, Sustainable Woodstock helped build and maintain 25 raised beds alongside individual mobile homes at the Riverside Mobile Home Park. After the park was badly damaged by tropical storm Irene, we returned to rebuild those gardens in time for the 2012 summer growing season. Sustainable Woodstock has also helped establish gardens behind Mellishwood affordable housing and at the Woodstock Elementary School. Gardeners pay a small fee to cover garden preparation and maintenance costs. We are also grateful to The Friends of Burlington Garden, the Woodstock Garden Club and the Woodstock Rotary Club for their support of this project. For more information or to check plot availability, email Kerry Rosenthal. Click here to see the guidelines: SWCG Guidelines 2019. Or click here to download a registration form: SWCG Registration Form 2019.